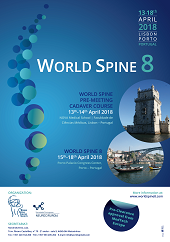 It is our great pleasure to announce World Spine 8, the congress of the World Spinal Column Society, which will be held in Porto, Portugal, in April 2018. The organizing committee is preparing a first rate and innovative scientific program, in which participants are strongly urged to engage in the discussions and to interact with the renowned international faculty. “Having fun while learning” is the motto of the World Spinal Column Society. Hence, World Spine 8 is designed to provide an enriched environment, in which camaraderie, fellowship and collegiality are inextricably woven into the educational experience. Abstract submission is encouraged, thus stimulating the active participation of all participants in the scientific program of the congress and securing their contribution to the overall success of the meeting. Porto is a vibrant city, with an historic center that is classified as a World Heritage site by UNESCO and elected Best European Destination in 2017. We look forward to seeing you in Porto and to counting on you as a major player in this event.